Soft goat cheese, or chevre (French for goat), is cheese made from the milk of goats. Most people that are allergic to cow's milk or those who are lactose intolerant usually can consume goat's milk products, including babies as it's easily digestible and has non-allergenic properties. 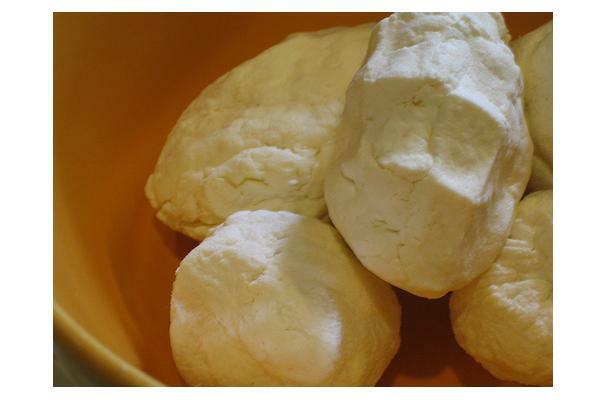 Fresh artisan goat cheeses are not usually aged, so they are fresh and creamy looking with a fairly mild, salty flavor. 1. To find great cheese, first find a great cheesemonger (one who sells cheese); make him an important person (a big cheese!) in your gastronomic world. You’re looking for someone whose passion for his craft is as palpable as a ripe Camembert. A good cheesemonger will guide your purchases, and help you find cheeses that exhibit the perfect combination of taste, texture, color, and aroma. They will answer your questions, help you educate your palate, and offer specific serving suggestions (including wine recommendations, if needed). 2. Keep an open mind when you approach the cheese counter. Instead of shopping from an inflexible list, shop for cheese as you would shop for fruit: What is ripe? What is in season? Cheeses do have seasons—and even vintages! 3. Taste before you buy. If a sliver isn’t offered, don’t be shy. Ask! Of course, this doesn’t apply to cheeses meant to be sold whole, such as Epoisses, or Pont L’Évêque. 4. Like many people and most wine, young cheeses generally have less depth, richness, complexity and flavor than more mature specimens. 5. Be wary of cheeses that are cracked. If the cheese has a cut side, make sure it looks fresh; the edges should not look dried out. 6. Artisanal cheeses are usually much “scruffier” on the outside than mass-produced ones. The more rustic the rind and the more natural the color, he says, the more memorable the cheese is likely to be. 7. Visible interior mold is a deal-breaker, unless the cheese is of the blue genre (the interior mold, for example, of a fine English Stilton is key to its character). Exterior mold is often desirable. 8. Smell the cheese, if possible. It’s perfectly acceptable if you catch a whiff of soured milk, or a "barnyard" smell, particularly in washed-rind cheeses. But if those aromas are overbearing, the cheese could be past its peak. Also, look out for the smell of ammonia—often an indication that the cheese has aged too long, or hasn’t aged properly. 9. It’s better to have your cheesemonger cut your cheese selections fresh; avoid pieces already wrapped in plastic if at all possible. 10. This seems like a no-brainer, but check the label on the cheese. If the merchant says the cheese is from France, you might want to confirm that on the label. Also take a look to see if there’s an expiration date. 11. Treat your cheese well! If you’ve purchased your cheese from a caring and reputable cheesemonger, your cheese has likely been lovingly coddled and tended to for all of its natural life. It’s up to you to insure the continuation of that quality of life, right up until the moment you or your privileged guests consume it. That responsibility starts when the cheesemonger hands you your package. More shopping to do? A long car trip ahead? Bring along an insulated cooler as you would if you were purchasing fresh seafood. I’ve found an insulated lunch bag (the kind that holds a frozen gel pack in a separate compartment) is a convenient tote. 12. Strive to eat your cheese at its peak of perfection. This can be a tricky moment to pinpoint, as some cheeses have exceedingly long shelf lives, while others are quite ephemeral. Generally, the harder the cheese, the longer it stays fresh. To be sure, always solicit the opinion of your passionate, knowledgeable cheesemonger. Buying: You can buy Soft Goat Cheese on your nearest supermarket. If your local cheese / dairy house doesn't have it, try looking online. Procuring: Try this video to make your own Goat cheese. Arrange whole or sliced plain goat cheese on a serving plate. Sprinkle with fresh or dried herbs of your choice and drizzle with extra-virgin olive oil or vinaigrette. Serve with crackers or bread. Place two whole or split a 5-ounce goat cheese round in a pint jar. Add garlic, cloves, parsley, a few peppercorns, a spring of thyme, and 1/2 of a bay leaf. Cover all with extra-virgin olive oil and let sit for a few days. Serve with crackers or bread. Once home, make sure the cheese is well-wrapped in waxed paper, plastic wrap, or aluminum foil to keep air and refrigerator odors out. Store in the humidity-controlled drawer of your refrigerator, if possible, until about an hour before serving (or longer, for some cheeses). Never, ever freeze! History: Goat cheese is being used in the kitchens of some of the most famous restaurant in the U.S., as Americans have enthusiastically embraced the taste of goat cheese in their favorite dishes, including pizza, ravioli, sauces, and appetizers. Fresh goat cheese also pairs wonderfully with the local wines and microbrews. Everyday, more and more people discover the delights of goat cheese, thus continuing the demand for it.